The beers had helped me sleep, a little, but I’d still woken a couple of times in the night, each time listening to the tropical storm lashing down outside exactly as forecast. I was lying staring up at the ceiling. I had very little to do: throw my cycling gear on; lug the already packed rucksack across the gravel drive to drop it in the garage, fetch my bike, eat some breakfast and cycle 15 minutes to the start. I could easily have stayed in bed another 15 minutes and not even been close to late, but the pre-ride nerves were jumping in my stomach. With enormous reluctance I left the last comfortable bed I would be likely to enjoy for the next five nights, and made a start. I vaguely remember eating some breakfast, and I’m sure I checked my bike and bags a number of times, the rest is largely a blur though. 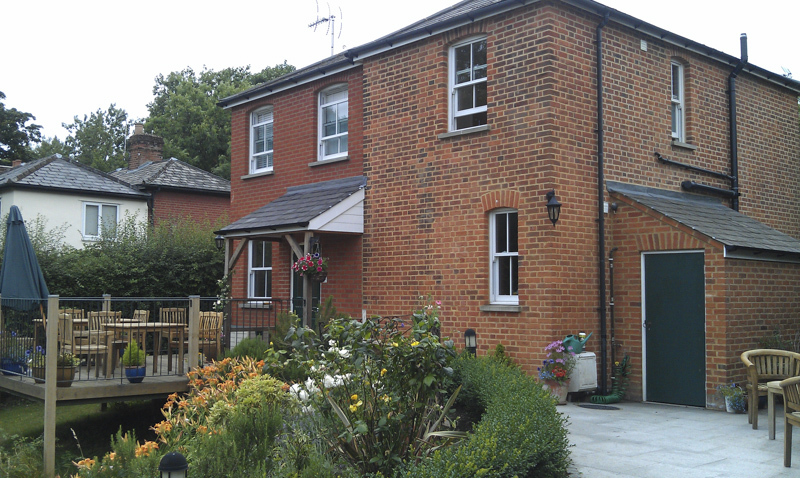 The nerves had escalated to such an extent that I even managed to ignore Michael saying good morning to me from the door of their room above the garage opposite the main B&B building. If Emmerentia hadn’t chided me, we could well have parted on the misunderstanding that I’d deliberately snubbed him, not ideal with the likelihood of our paths crossing on the ride to come. As the clock ticked around to 5:50am I just had to get on the road. I still had plenty of time, and Emmerentia would have been literally 5 minutes behind me, but I just couldn’t wait around any longer. I charged down the lane towards the start, mild panic starting to set in as my watch approached 6am. How strict were they going to be on need to be there 15 minutes ahead of our start time, which was rapidly approaching? Luckily the side gate to Davenant School was still open, and after stopping just before it at totally the wrong gate, I found the correct entrance and avoided the detour loop around the housing estate. Needless to say, I was there in plenty of time, my 06:15 start group were only half assembled. I’d just had time to visit registration and learn that we didn’t actually need to have our brevet cards stamped on the way out, when Emmerentia also arrived. Her cousin had arrived to see her off, and hadn’t even finished asking me if I knew where she was before she pulled up to where we were standing. He’d clearly spotted my South Africa cycling jersey, and figured I might know her. By now my start group were assembled and looking ready to go, but I was all over the place. My bike and kit were ready, but I just wasn’t. I quickly asked the marshals if I could drop back to 6:30am and start with Emmerentia. Starting the ride with a friend seemed exactly what I needed to calm my nerves and work me into the ride. I was told it was no problem, as long as I didn’t mind effectively losing 15 minutes before I’d even started. To be honest, it hardly seemed to matter – riding with Emmerentia, a significantly faster rider than me, we’d make that back over the opening stage anyhow. After a last sip of coffee from her cousin’s flask, Emmerentia and I rolled off to the start. I’d parked my bike right under a bird’s roost, and now had a copious dollop of bird crap sprayed over my Garmin and bar bag. Remembering that it’s supposed to be lucky to have a bird anoint your hat, I took this as a good omen – a white dove had sent me on my way with a small blessing on my navigation and luggage. I did wipe it off though – the next few days would be tough enough without a bout of bird flu. I messaged Yoli with something along the lines of “here we go“, and started Endomondo so that the live tracking feature would let her follow my progress. All of a sudden things became much more familiar – we were funneling into a start chute system, much like any other bike ride. At the entrance to this, two girls noted down the rider numbers from our frames. I was told I could head off immediately, since my start group had already gone – and there was a look of some surprise when I explained I was going to drop back and start in group D with Emmerentia. I knew I’d kick myself if I missed my finish time by the 15 minute margin I had already given up, but it seemed so remote and unlikely I waved the thought from my mind. 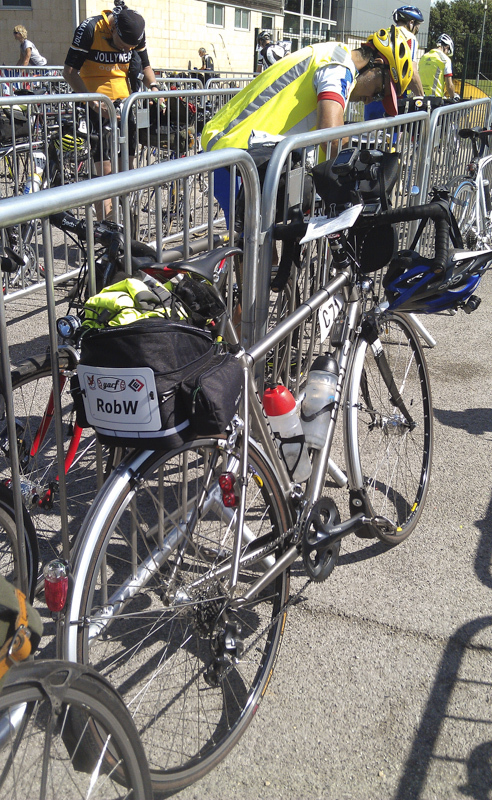 As we pushed bikes to the front of the D chute, a video camera appeared in my face, and a voice said something like “you must be Rob Walker, I’m Exit Stage Left” (his user name from the YACF forums – ESL for short, real name Damon). I forget exactly what words I spoke into the lens, but I do seem to recall ESL also commenting about my decision to start in a later group, and also that my accent sounded more British than South African. As he moved on to film other riders, the marshals opened our start chute, and waved us through to begin our ride. This was it, the months of dreaming about LEL were over, it was finally here, the clock had started and we were on our way. In no more than 116 hours we would need to be back at this same spot, or be logged as a DNF. That was not a prospect I wanted to dwell on. We hadn’t even reached the front gates of the school before I heard something rattle onto the tarmac behind me, and voices from the riders behind calling out that I had dropped something. Emmerentia’s cousin sprinted up carrying my lock, which had bounced off as we crossed the kerb onto the school drive. I started to fiddle with putting it back in place, and then realized it was just going to become an annoyance and eventually get lost. I handed it back to him, muttered something about him scoring it off me, swung around and pedaled quickly up to where Emmerentia was waiting so we could get our ride underway properly. I’m not sure how I figured a lock with no keys would be of use to him, but LEL was waiting and it was time to get riding. The route went back past our B&B at Bell Common, before swinging right into Epping high street, and soon after turning off left somewhere before we reached the centre of town and the restaurant we’d eaten at the night before. From here on in, we were into uncharted territory – albeit I was sure I would recognize some parts of the route from living and traveling around the UK. Over those early kilometers we saw a good cross section of the weird and wonderful machines taking part: recumbents, with their riders casually laid back as if pedaling from a sofa; fully enclosed velomobiles rumbling noisily along, sometimes at great speed on the descents, their drivers keen for the slightest breeze wafting through their sweaty fiberglass boxes. Even some of the bicycles didn’t exactly seem suited to such a ride: small wheeled, folding Bromptons; and later on we’d encounter at least a couple of tricycles. Oddest of all though were three riders on EliptoGo machines – basically a gym stepping machine with gears and wheels. We passed them stopped on a hill no more than 20 or 30km from the start, and Emmerentia and I commented on how brave they were – and how tough it would be to complete the full 1,400 kilometers standing up with no saddle to sit on. Stopped by the side of the road already with some issue or other, it seemed improbable they would make it all. Their brave endeavour made my challenge seem positively ordinary. A lot of the lanes we were now traveling were fairly narrow, and traffic often passed quite close. It seemed we both felt more comfortable safely out of the way of any incidents by leading the head of our small bunch, and we sat there comfortably pacing along through a steady succession of left and right turns, as we wove through small villages and towns. Emmerentia mentioned she was starting to feel nervous about not having a GPS, with the route involving so much navigation and little in the way of signage. For now though, my GPS seemed to be keeping us on track perfectly. At 99km, this leg of the ride was the longest. Even without a mild dehydration from the beer the night before, I knew it would be a struggle for me to make that distance on two bidons of water with the heat forecast for the day. So I was fairly sure we’d need a mid way stop at a shop or petrol station to top up. For now though, we were motoring nicely, pushed along by a friendly tailwind which at time saw our speed up around the 30Km/h mark without really requiring any effort. With typical sod’s law, I emptied the last bottle just after we’d passed one of the few shops so far on the ride, in an insanely picturesque village which I seem to recall was Barrington. I was left hot and parched for a few kilometers. We stumbled across a campsite attached to a mini-golf course. The latter seemed rather closed down – no signs of a clubhouse, shop, or fridge full of nice cold drinks. At least being a campsite though, it had drinking water and toilets, both very welcome by this stage. Just prior to the campsite stop one of the “trains” of faster riders had blasted by us, accompanied by a resonant bass drone from their deep section wheels. Once again I was amazed by how lightly equipped some of the bikes were. These riders were on light carbon race machines, and none of them had more than a tiny under seat bag for spares or supplies. At least a couple of them only had a single bidon. They had to be one of the groups with a support crew following, or else extremely confident. For a short distance they broke up our group. Emmerentia stuck with them for a few corners, as did the two German guys we’d been riding along with since pretty much the start. I was beginning to blow a bit, and there was no way I wanted to try and stick with a fast pace so early on. So I’d already dropped off, and soon after Emmerentia fell back to stay with me. And here I’m afraid, my recollections of that first leg start to get patchy. I remember Emmerentia and I rode together for the rest of the leg, but aside from that only a couple of little details come back to me. Somewhere we went down a descent called Chapel Hill, and through a lovely little village with a shop on the corner. In fact, I think this was before the campsite stop because I remember looking at the shop wondering if they had water, but it looked still closed at this hour on a Sunday. We also crossed over the London to Cambridge bike ride along the way too, although being an early group all we saw were the marshals and none of the riders. I read some of the later guys enjoyed hearing the marshals calling out “Edinburgh riders go left, Cambridge riders stay right“. What must those folks on their fun ride have thought of this bunch of mad cyclists riding to Edinburgh. I’m sad to have missed out on that potentially wonderful bit of humour. One other view I vaguely remember from the early section of the ride is looking out at beautiful old buildings either side of water – I remember commenting that it looked like a mini Bruges. I think this may have been on the approach to St Ives, which is built on the banks of the River Ouse, although I could also have confused this with Spalding on the next leg, which is also built around waterways. Apart from crossing a few trunk roads, for most of the first leg we had been riding relatively quiet lanes. As we reached St Ives though, we turned onto busier roads on the outskirts of town. We wound around the town a fair bit, until finally the Garmin track started showing the waypoint flag marking our destination. 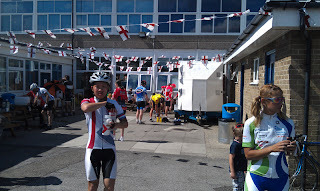 We turned left into a housing estate, and at the top of a gentle rise was St Ivo School – not only the first control of LEL, but my first ever Audax control. As we dismounted, I recovered the brevet card from my bar bag. It was exciting to be about to receive my first ever control stamp. There was no queue, and it was all done rather quickly, a smile and a cheery greeting, and we moved on to scout for food. I may have missed it, but I didn’t spot any hot food – it was probably there, but for now a couple of cheese and tomato sandwiches, some snacks, juice, and a cup of sweet tea actually seemed to fit my appetite. 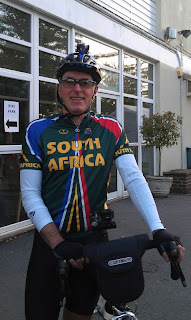 At this stage, the experienced audaxer in Emmerentia showed through. I had barely sat down to eat, whilst she was already finished and keen to get going again. I’ve read many times about efficiency at controls, and clearly this was something Emmerentia had learned, and I had yet to master. Our very different riding speeds were starting to show on the approach to St Ives too – and it was clear this was a perfect natural break where we should start to ride at our own pace. Emmerentia double checked I was OK with this, which I certainly was – I’d never really expected us to ride together at all, so it had been an unexpected pleasure to travel the whole of the first leg together. The German guys we had ridden with were getting up to leave, and Emmerentia grabbed her chance – asking if it would be OK for her to ride with them. It was a good choice, they rode a similar pace, and at least one of them had a GPS for navigation. We bade farewell, and set about our own individual LEL adventures. Mine started by relaxing in the canteen – I knew it wasn’t good form to linger at controls, but I was enjoying the break and some time to update Yoli on my progress. Eventually I hauled myself up, grabbed a banana and some snacks for my jersey pockets, and headed back to my bike to top up the water bottles. Having trained the last few months without energy drinks, I had a simple plan for hydration: one bottle plain water; the other alternating between Rehidrat Sport and High Five zero tabs. Both of these being basically just electrolytes, although the Rehidrat has a very small amount of sugars in it too. I also quickly visited the mechanic, who did a crude on the spot adjustment to my rear shifter indexing – it hadn’t been changing cleanly on the way up from Loughton, despite having been perfect the previous day. My guess was it must have got knocked somewhere, perhaps when parked for registration or at the B&B. I switched the Garmin back on, selected N2 on the menu of tracks, and mounted up. I did a couple of test loops of the circle at the school entrance, stopping for a minor additional tweak. Satisfied the shifting was serviceable, I rode out to start my second ever leg of an Audax ride. Time of departure from St Ives: 11:02. The second leg to Kirton was slightly shorter at 81km. Being almost dead flat across the Cambridgeshire and Lincolnshire fens, and with a tailwind, it looked likely that we would continue to make good time. There was, however, the rather worrying thought that we might have to battle back along these same lines into a headwind, and with 1,200km in our legs. Unfortunately that was exactly what the current weather forecast was predicting. Whilst the terrain may be flat, it would be merciless in a strong headwind. There would be nowhere to hide. By this stage I was riding solo – and enjoying the freedom of making my own pace. When I’d left St Ives control I couldn’t shake the feeling that I had left something behind. I realised as I pedaled my way into this leg what that something was – I was riding lighter and feeling easier. I had literally left a behind a weight that had been on my shoulders – the pressure of trying to ride at someone else’s pace. I know Emmerentia will understand that feeling and hopefully not take offence. It had been great to ride together, but there’s nothing tougher than riding above or below your own natural pace for any distance. I could now plod along at my own steady pace without fear of holding anyone back. Crowland Abbey. I briefly tried to find a photogenic view of it from our road, but it was partly obscured. In the middle of the town were the ruins of a beautiful old bridge, and this time I did manage to snap a quick picture. My sightseeing had split me from the guy I had been riding with, so I pedaled slowly through and out of the other side of the pretty little town. The road crossed a narrow bridge, and a sharp right turn after the bridge deposited us into Holland. We were now riding a very narrow road along the banks of a dike. I guess “navigation” would probably be the more correct word, since the waterway was actually a man made channel for the River Welland. It was simply lovely, although the road was so narrow that cars had to drive on the grass verge to pass us. Luckily the cars were few, making it easy to enjoy the serenity of the setting – ducks, geese and swans on the water, and an occasional barge chugging along. The wind continued to push us along, at times even meandering along solo I think my Sigma was reading over 30Km/h. And that was without raising my effort levels into anything close to the red zone. The banks of the Welland swung away to the right, and our route carried on straight into the town of Spalding. We were still in Holland, only this time it was Amsterdam with a canal for a main street. Or maybe it was more like those Cotswold villages with streams through the middle of the town: Bibury; Bourton on the Water; or one of the Slaughters. Whichever it was, it was very quaint. There is not much I remember in detail about the stretch from Spalding to the approach of the next control. Not that the rest of the leg wasn’t pretty – I recall green lanes along field side dikes, and greeting the occasional person out cutting their lawn or walking their dog. But no real features stood out to me compared to the previous stretches. It was fast and easy riding though, and the control came up in no time: Middlecott Schoool in Kirton. My second ever audax control – not quite the same level excitement as St Ives, but still a milestone to be savoured. If my control efficiency had been lacking at St Ives, I was now positively dithering. There was quite a queue for tea and food as well, slowing things down even more. A wonderfully friendly volunteer actually went and refilled our cups of tea whilst we were in the food line, the first cup having disappeared without trace. Despite loading my tray with a hot main course, and pudding with custard, I didn’t feel hungry at all. I knew this was a very bad sign for an audax rider, and something which I simply had to overcome. With no energy drinks in my bottles, the food in front of me was the only fuel I would have to meet my energy needs. Luckily, Yoli back home knew the importance of this too, and continued her encouraging text messages of “Eat, Eat, Eat” on my phone. I took a couple of small bites, and washed it down with some blackcurrent juice. It didn’t help that the school hall was hot as well. I quickly shed my UV arm protectors, and at the same time someone opened a door and a lovely breeze wafted in. My mood and appetite started to pick up. What happened next, as I attacked my plate with a renewed interest, was truly surreal – the sound of Dancing Queen wafted over us from the stage . 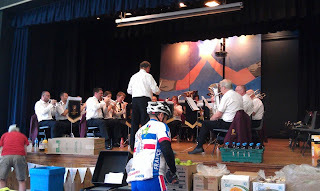 A school hall on a Sunday afternoon, filled with cyclists sweaty from the first 180km of a colossal ride, stuffing their faces with lashings of food, were now being treated to the brass band’s ABBA set. It worked though. It made me smile, and then laugh out loud, and then turn to the riders seated near me and check this was really happening. Before long, the whole table was laughing, and we were all taking pictures, and messaging back home. Being efficient at controls might be important, but this was priceless, and the boost to my spirits was worth way more than the extra minutes I’d spent there. I think Yoli enjoyed the moment back home too – a brief if somewhat bizarre experience to connect her with my ride. Finishing up, I located my shoes in the piles outside the school hall, and headed outside. A quick check over the bike, and bottles filled, I struggled for a moment to find get a cell signal so I could let Yoli know I was on my way again. The Garmin sprang back into life, and my third ever Audax leg began. I could feel the steady routine of riding, controls, and eating slowly working it’s way into my psyche. Time of departure from Kirton: 15:25. Control efficiency getting worse, enjoyment factor growing. My memories of the leg to Market Rasen are very sketchy. I remember chatting with another rider about possible sleep strategies. It looked like the next control was going to be way too early for a proper sleep stop, but Pocklington was another 90km beyond that control. One possibility was a short sleep stop, and then push on. Another option might be a Travelodge or B&B. Happening to pass one seemed quite unlikely, although on one of the long straight Fenland roads we did ride past just such a low cost, no frills hotel. I was getting ahead of myself though – a golden rule of audaxing is don’t think beyond the next control, so I refocused my mind on the leg at hand. The wind continued to blow, mostly from behind, but occasionally from the left as the roads swung slightly westward, tracing our arcing path up the country. On the early stretches of the leg, we traveled a long straight section of road following the line of the River Witham a couple of fields away to our right hand side. At the end of this straight the road and river met, and we were in Holland again, once more riding along the banks of a dike, barges motoring along the waterway beside us. A tranquil scene which would have made a perfect backdrop for a relaxing summer holiday, if only we’d had the time to stop and enjoy it. Riding along the river, we had started to catch up the remnants of the storm clouds from the night before. Left, right and ahead were small patches of darkened sky, a few of which showed tell tale blurs of rain sheeting down from them. It seemed inevitable that we would collide with one of these showers before long and get our first LEL drenching. The road swung left away from the river and then back right, onto a main road for a brief stretch to cross back over the river. As it did so, as if by magic a garage forecourt appeared over the bridge. With the first drops of rain falling, I pulled under it, joining half a dozen or so other riders who had also decided to take shelter. The little shop beckoned, so I tucked in to a bag of cheese biscuits and topped my front water bottle up with coke as the shower blew over. Noticing the time, I made a quick call home – I wanted to make sure I spoke to Yoli and our young son Ben before his bed time, which would probably be past when I reached the next control. It was wonderful to hear his and Yoli’s encouraging voices on the end of the phone, even for just a few brief minutes. They were rooting for me to keep going. It’s not that I hadn’t been enjoying myself up to this stage, but something had been missing – maybe a mild hangover from the beers, or just early ride nerves. Either way, the call home and the caffeine in the coke perked me up and I was eager to be riding again. Mounting up, we pushed on – through Woodhall Spa, and the lanes afterwards gradually became more winding, with slight gradients. We were starting to leave the flatness of the fens behind us. I wondered if we would be heading towards the Linconshire Wolds. I remembered my father talking about them being on the south eastern border of Yorkshire, which was definitely the next county we would be entering somewhere after the next control. Whilst riding, I had been keeping all distance indicators switched off on my GPS and Sigma bike computer. Instead, I had adopted a routine of making a rough estimate of my arrival time at the next control based on distance and expected average speed. Having done this, I tried to forget about distance and just enjoy the scenery and riding for the rest of the leg. So far it had worked superbly, giving me a remarkably accurate idea of when to expect the next control, but at the same time keeping my mind off how far we were riding. So it was very welcome, but not exactly surprising when the signboards started to count down our arrival: 3Km, 2Km, 1Km, and we were there. Market Rasen – my third ever Audax control, and a perfect time to stop for dinner. The debate from earlier was answered even before I’d dismounted and headed in to get my brevet card stamped. Not only was it way too early to be considering a sleep stop, but I wasn’t even remotely tired. So, I followed another of the golden rules of audaxing – I wasn’t riding or sleeping, which meant I should be eating. I headed to the canteen line, and loaded my tray with roast dinner and pudding with custard. Despite having a similarly large hot meal three hours ago, I was starving. At the drinks station, I opted for coffee and sugar. The next leg would see us riding into the dark, so it seemed sensible to go with the caffeine option. “Eat eat eat” read the text from Yoli, which as luck would have it was exactly what I was doing at the time the message came in. A second cup of sweet coffee was needed to help the wonderfully stodgy pudding down though. With 3 legs down it struck me that I was now close to the distance of my longest preparation ride. The next leg would see me head off into unknown territory fitness wise. Fully fed, I sought out the drop bag room. So early in the ride, it was quiet. In truth, most of my bag contents were spares or contingencies more likely to be needed on the the journey home. On the way back from the drop bag room, I was accosted by two girls who had spotted my South Africa flag jersey. It was Gillian and Michelle, who excitedly introduced themselves and diverted me to a table to where the other SA riders were sitting. It was great to meet them, and there were clearly no hard feelings from my failing to meet up with them the day before. It was also an amazingly fortunate piece of timing – in a few more minutes my jersey would have been changed, and I would be a much more anonymous and hard to spot figure. Greetings and summaries exchanged on our rides so far, I made my excuses and headed for a quiet corner to root around in the drop bag. First on the agenda were the practicalities of a clean shirt and shorts. The shirt could go on now, but the shorts would just about cram into my saddle pack with the space left by removing the leg and arm warmers. I’d been cautioned about the dangers of riding a second day in the same shorts – sweat turns to chaffing salt crystals, a lethal combination on a saddle sore backside. Also, there was a chance of rain on the next leg, and sleeping in wet shorts really did not appeal. The top I could deal with, since I had a thermal vest in the saddle pack that would do for sleeping in if needed. The second, and infinitely more interesting item buried in the drop bag was an envelope from Yoli marked Drop Bag 1. I was excited to see what delight lurked inside. 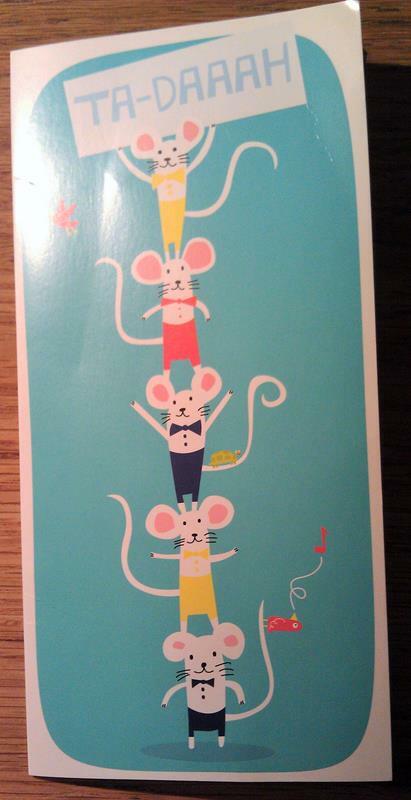 The envelope contained a card with a stack of mice holding a TA-DAAAH sign, and inside were words to congratulate me on finishing my first day (and a note that Ben had chosen the card). The message may have been a little early, but I had at some stage debated sleeping here, so the confusion was understandable. It was a precious and motivating message from home either way, and in around 90km the words would be true hopefully. 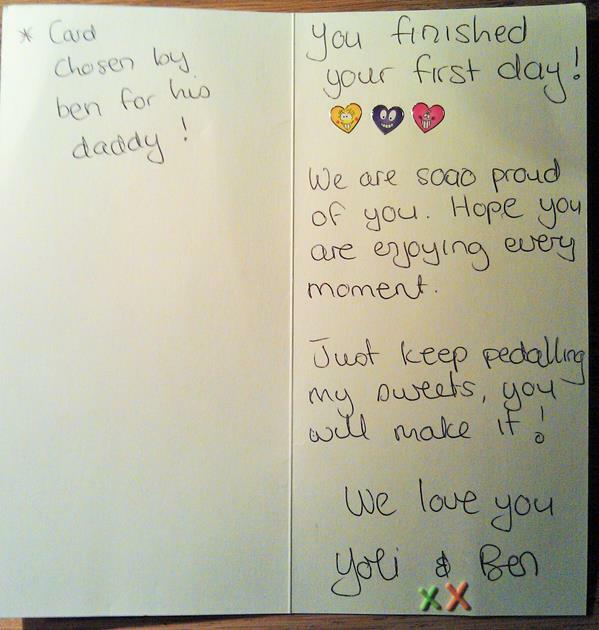 I called Yoli to thank her for the card and let her know I’d soon be on way to Pocklington. I returned the drop bag for the southward journey through here, refitted my saddle bag, topped up my bottles, sparked up the Garmin and headed out for my fourth ever audax stage, and the last of today. Time of departure from Market Rasen: 19:53. Seriously, an hour and sixteen minutes? If my control efficiency got any worse that fifteen minutes late starting wouldn’t matter because I’d need an extra week to get around! 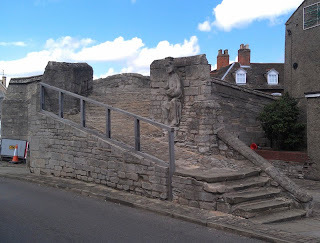 During the early part of the leg, we wound through a town – I think it may even have been Market Rasen as we set off. I heard a “Not another Rob!” comment from a group of riders alongside me. I forget the exact exchange, but it was along the lines that they’d already got one of those and he was grumpy enough. It transpired that he was a Robin rather than a Robert, and he was riding with his daughter Georgina. 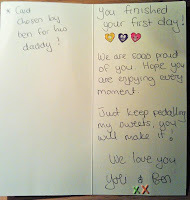 I’d often wondered if Ben and I had a cycling adventure at some stage in our future, and the thought came back to me now. The roads were wet and we were splashing through puddles as the lanes wound onwards. The showers had clearly continued to fall whilst I was at the control. The smell of damp woodland enveloped us as we rode through a tunnel of trees. It was magical. The terrain continued to become more rolling, every now and then the road became steep enough to push me down onto the small blade and granny rings. With each rise, the shadows grew longer as the fields each side of the road became bathed in the deep orange glow of the evening sun. A little before dusk we caught up with two American riders, with “Oregon” written on their jerseys. After introducing myself, one of the girls told me her name was Susan. “Wait, you’re not Susan Otcenas are you?” I asked, a little amazed. It turned out she was. We’d swapped a number of Facebook messages over the preceding months. 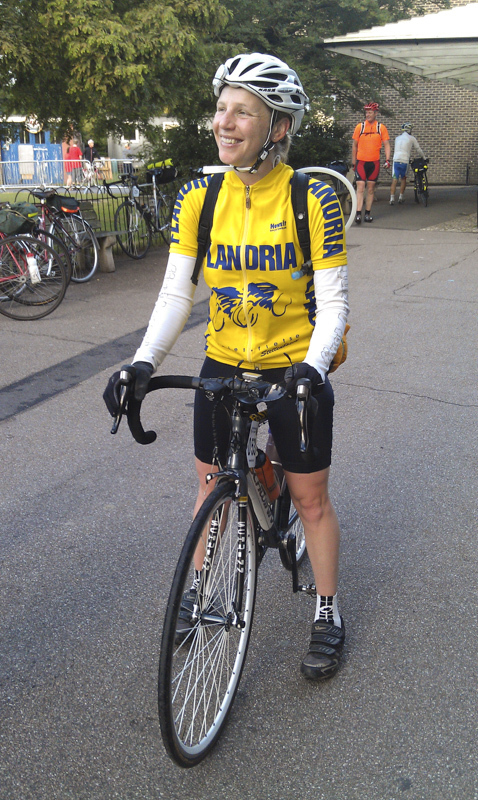 I knew from reading her entries that Susan was a seasoned randonneur, as it turned out was her riding companion Leslie. It was great to meet up and ride with someone I’d bantered with online. We chatted and swapped stories about our riding, our bikes, some of the routes we rode back home. At some stage, I shared my guilty secret – that despite some decent training, at that very moment I was now officially on my longest ever ride, and heading towards my first ever imperial double century. I’m not sure if they were surprised or shocked, but I suspect somewhere inside they must have wondered if I would have the legs to finish this ride. Somewhere deep inside, I wondered if I would have the legs to finish this ride. As we rode along we were joined by a recumbent rider. I think his name was Graham, although I confess in the excitement of the day I may have got that wrong. Emmerentia and I had actually ridden with him right at the start of the day too (at that stage he gave me his YACF name, gone from memory now). Just ahead, occasionally obscured by hills or trees, were three sets of red lights in the sky. One of these was clearly a pylon or mast on the distant horizon. It took me a moment or two to figure out the first two sets though. 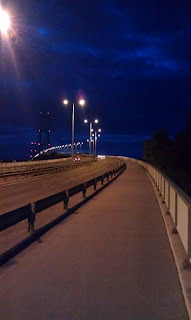 And then it came to me, we were closing in on the Humber Bridge. My heart jumped, and I immediately mentioned it to Susan and Leslie. Graham confirmed it, the bridge was just a couple of kilometers ahead. I was excited – crossing the bridge in the last of the daylight would be magical, and it also meant we were already almost half way to Pocklington. The residential streets leading to the bridge were quiet, but on the side lane leading to the bridge we had a small greeting committee of volunteers directing us up onto the east cycle path of the bridge. The moment was too cool to waste, and we all stopped to grab a photo. Graham had said something about there being a big climb the other side of the bridge, an option being to risk a possibly busy bypass to avoid it. Not really being sure of this, Susan, Leslie and I stuck to the official track, which wound back on itself under the bridge and through a sort of bridge-side park. It was dark and deserted, and faintly eerie. Oddly, I don’t think we ever found the steep climb which Graham had mentioned, and we didn’t see Graham for the rest of the leg either – we held back for a while, but eventually presumed he had taken his bypass option. After a few kilometers of suburbs we headed out onto country lanes again, only this time it was fully dark. I’d lit my dynamo powered front and rear lights quite a bit earlier, and at some stage just before the bridge I had powered up the Lezyne front light too. Both came into their own now, and together with the lights from Susan and Leslie’s bikes the road was positively floodlit. None of us had problems making out the road ahead, which was very good news since at times it became a risky mix of potholes, gravel, puddles and mud. Using brakes or carrying too much speed through any one of those sections could have easily ended in a nasty fall. Villages came and went, each progressively quieter than the last as evening turned to night time. Pubs closed and people retired to their homes. The lanes rose and fell progressively as we pushed into Yorkshire and our destination ahead. I was enjoying my first night time audax riding. I was close enough to hear the air leak out as Susan’s tire punctured. Dumb luck, we were less than 10km from the control. Another American rider, I think his name was Jonathan from California, was stopped at that very spot, I think also dealing with a puncture, or perhaps just having a snack break. It seemed all the debris on the road must have hidden some glass or other puncture inducing sharps. Susan insisted I push on to the control. I checked several times before doing so – it felt wrong to be leaving them at this stage, but Jonathan was already setting about helping change the tube. Very soon afterwards I was at the control getting my brevet card stamped, and once again filling my tray with food. Jonathan must have been quick because I’d barely lifted a fork before I saw Susan and Leslie also sitting down to eat. The board for beds was in the middle of the canteen, and the situation did not look optimistic. Some riders were already sleeping on the floor of the canteen. There didn’t seem much point worrying, so I went and got a couple of glasses of milk, and washed an Ibruprofen down with them. I wasn’t in any huge amount of pain anywhere, but I knew tomorrow would be a different story and anything to help keep inflammation down was worthwhile. Even though it was past midnight, I’d already messaged Yoli when I’d arrived. I took out my phone again, closed down Endomondo and recorded a few highlights in the notes for the ride. It was nice to think they would be automatically posted to Facebook, keeping friends and club mates back home updated with how I was doing. And I was doing great. I sat in the canteen for a few minutes with a stupidly smug expression on my face. I had a few aches sure, but nothing significantly worse than my preparation rides. I’d completed my first day of LEL, ridden my furthest ride ever, and made it to the control I had been aiming at despite some serious concerns about the distance from the last control. Time for bed. Bed as it happened, was a blanket on a wooden floor and my rolled up rain jacket for a pillow. No mattress, as all of those were booked. I was disorganised – I’d brought way too much stuff into the dorm, and it was scattered all around my sleeping space. There was a serious risk of me not gathering up some essential item the morning after, so I tried to rationalise where things were stashed, the two main locations ending up being my helmet, and the back pocket of my jacket. I would definitely need to refine this process at the next sleep stop. There was no wake up system, so I set an alarm on my phone. I realised how anti-social this would be, and so set the phone to silent assuming this would also include the alarm. With that I tried to sleep. It took a lot of tossing and turning until it suddenly dawned on me that the most comfortable position was with all my sore parts directly on the floor. The pressure seemed to almost have a massaging effect, and despite being on a hard and bare wooden floor, I surprised myself by drifting off to sleep.